Rabbi Haim Ovadia is committed to making Judaism relevant & meaningful to all. Also on iTunes! Rabbi Ovadia explains some of the psalms with explanation. Psalms are full of ... Más informaciones expression, love, sadness, hope, and many more. Some read psalms daily, weekly, in time of need, in tragedy, in celebration, to express what's in our hearts and minds. Loosely translated as "legends", Aggadah includes the genres of biblical exegesis, stories about biblical characters, the lives of the Talmudic era sages and their contemporary history, ... Más informaciones parables, proverbs, and folklore. A captivating melange of wisdom and piety, fantasy and satire, Aggadah is the expressive medium of the Jewish creative genius. - Rabbi Haim Ovadia is the Rabbinic leader of the Magen David Sephardic Congregation in Rockville, MD. How does a Rabbi weigh his responsibility to Jewish law, to the sensitivities of the people involved. Difficult questions are usually never ... Más informaciones black and white. We discuss intricate questions asked to Sephardic and Ashkanazi Rabbis of current and past generations and their responses. What was the philosophy behind their answers? Why were concessions made in special situations? Iraqi Jewish Songs for Special Occasions, shabbat and Holidays נוסח יהודי בבל. Rabbi Ovadia's parents were from Iraq, before moving to ... Más informaciones the State of Israel. From a young age, he was gifted with being taught the many beautiful tunes of his ancestors. These were used in the synagogue on Shabbat and Jewish Holidays, at home, as well as at happy and sad occasions. Rabbi Haim Ovadia speaks about a plethora of topics on Passover. He discusses the Wondrous Passover Seder, legumes for all, history of the ... Más informaciones holiday, sensitive toward others, and how to live in today's world. Keeping kosher seems like it gets more burdensome over time. It's not that true kashrut has changed, but rather Rabbi's and kashrut ... Más informaciones organizations continue to raise the bar. But, is raising the bar a good thing? Is it that our ancestors were ignorant to the laws of kashrut? Or is it the fact that kashrut has become a business? Certifying toilet paper should tell us we have gone way too far. Here I give you the real deal. No smoke and mirrors. The pre-kashrut business and also what was once a kashrut issue may have changed because circumstances have changed. Most of all, on University campuses and different areas of the US and abroad don't have the same available Kosher products one might have in a place like Brooklyn, NY. This creates a problem for many and we must cater to those who need to truly know what is and what is not kosher. Otherwise, we risk them giving it all up and feeling that keeping kosher is too burdensome. We must return to the origins of our ancestors, who did not have the same availability as we have in some places. Most rabbis end up catering to those who already take for granted having dozens of kosher restaurants and unlimited products available. Do we simply preach to the choir, or deal with the struggle that is real. In addition, those who have that access may find themselves in a tough position when on a business trip, vacation, emergencies, and even working for Teach For America or Doctors Without Borders and so many more. Course Objective- "To understand the historical and social context and identify the message or hidden message". In this series, he ... Más informaciones analyzes select sections from Midrash. This is the full Academic Course on Midrash and all its facets taught by Rabbi Haim Ovadia in the summer of 2016 at the Academy of Jewish Religion in Los Angeles, CA. 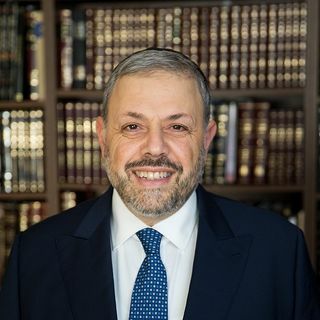 In addition to holding a faculty position at the AJR, he is also the full time Rabbinic leader of Magen David Sephardic Synagogue in Rockville, MD. The Semikha Program is free and open to all. You can listen to and read select lessons and texts at your own pace, from anywhere. Your academic and Judaic background, as well as non-formal classes you attend, will be counted. Introduction to the rich world of Sephardic prayers and music. In this podcast we explore the life and work of the great Sephardic scholars. "Rabbi Ovadia ha trabajado a través del mundo como rabino y como hazan, y esta ... Más informaciones extremadamente familiarizado con las tradiciones sefaraditas y las liturgias de las comunidades iraquí, marroquí, persas, sirias y yemenitas. Rabbi Ovadia nació y se crió en Israel, es de descendencia iraquí, durante su carrera ha creado y construido comunidades en Israel, Colombia, New Jersey, New York, California, y Washington D. C. También ha enseñado en varios colegios de Los Angeles y New York. בסדרה זו הרב חיים עובדיה דן בשאלות הלכתיות בעידן המודרני ומציע פתרונות מציאותיים המתחשבים במכלול הגורמים. כך לדוגמה מוצגת עמדתו של הרב משאש שאין צורך בכיסוי ראש, שיש אפשרות לוותר על עירוב במקרים מסויימים, יש דיון בשאלת השימוש בחשמל ביום טוב, וכן דיון מפורט הנושא התפתחות ההלכה מזמן התורה ועד ימינו, ומה עלינו לעשות כדי לעדכן את ההלכה.